As a former member of the Rajya Sabha, an eminent legal counsel, political activist,author, former Union cabinet minister, Dr. Ashwani Kumar wears many different hats. 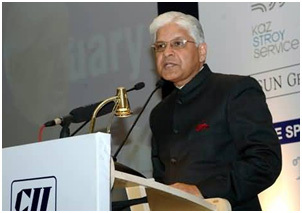 Born in Delhi on 26 October 1952, Dr. Ashwani Kumar graduated from St. Stephen’s College, Delhi. Thereafter, he pursued law and earned his Bachelor's degree in Law (LLB) from Faculty of Law, Delhi University, and his Masters of Philosophy (MPhil) from Jawaharlal Nehru University, New Delhi. In 2004, Kumar was awarded a doctorate in Law from Punjab University. At the age of 34, the Supreme Court of India appointed him as a Senior Counsel, making him one of the youngest advocates in India to be conferred the honour by the apex court. Dr.Kumar’s political career began in 1976 when he was appointed as the Secretary for the District Congress Committee Gurdaspur (Punjab). He continued to remain committed to politics and advanced the cause of the people at the grassroots through the various positions he held in the All India Congress Committee (AICC). From 1999-2000, Dr. Kumar was the spokesperson of the AICC and in 2001 he became the Chairman of the VicharVibagh of AICC. He was elected to the Rajya Sabha from Punjab in a by-election in 2002. Dr. Kumar was appointed as the Minister of State for Industry from 2006-2009. In the 15th Lok Sabha, Dr. Kumar was the Minister of State for Planning, Parliamentary Affairs, Science and Technology and Earth Sciences. In October 2012, he took over as the Minister of Law and Justice. He has participated prominently in many of the important debates during his tenure including on the Lokpal Bill, motion of thanks on the President’s Address, Union Budget 2014, issues of international concern such as the plight of Indians stranded in Iraq and privacy. Before his appointment as Union Minister, Dr. Kumar has served as member of the Public Accounts Committee (PAC) of Parliament and was also member of the Standing Committee of Parliament on External Affairs. He was also the Convenor of the Sub –Committee on Action Taken Notes of the Public Accounts Committee of Parliament (2009-2010). He was a member of the Empowered Sub-Committee of the High Level Committee on Manufacturing and has served as member of the Standing Committee on Commerce. Dr. Ashwani Kumar has also served as the Chairman of the Select Committee of Rajya Sabha for “The Prevention of Torture Bill,” 2010. Dr. Kumar was the Government of India’s nominee at the Davos World Economic Forum meeting in 2007 and in 2012. In August 2013, Kumar was elected as a Congress Party member of the Public Accounts Committee of Parliament. In November he was appointed as the Prime Minister's Special Envoy for Japan in connection with the arrangements for the visit of the Emperor and Empress of Japan and Prime Minster Abe to India. He was also nominated as member of the Standing Committee of Parliament on Defense in August 2013. Kumar addressed a session of the United Nations General Assembly and United Nations Security Council in October 2013 as member of the Indian Parliamentary Delegation to United Nations General Assembly. Dr. Kumar was honored with Honoris Causa by Punjab University in 2005, was a visiting Distinguished Fellow at the Trinity College Dublin (2016) and has spoken at the Oxford Human Rights Hub, the Fletcher School of Law & Diplomacy, University of Birmingham and King’s College London, among others. Dr. Kumar authored his first book titled Law, Ideas and Ideology in Politics; Perspectives of an Activist in 2003. He has also written a number of writing a number of scholarly articles on law; economic reforms; elections; democracy and international affairs. Dr. Kumar has travelled widely and delivered lectures and key note addresses on global tax conflicts; science and technology; economic reform process in India; etc. He was leader of the Indian business and Government delegations to various countries and has been extensively interviewed on domestic and global issues by the print and electronic media including the BBC, CNN, The Times of London, Le Figaro, Les Echos and The Dawn (Pakistan).